﻿Wood Bulk Vending Racks - Custom order only. Call. TOMY GACHA CAPSULE VENDING MACHINES = USED / Nice ! vends, one atop the other. Quantities may change. Call number shown at top of page. 1) You're getting 2 vend heads on each machine. 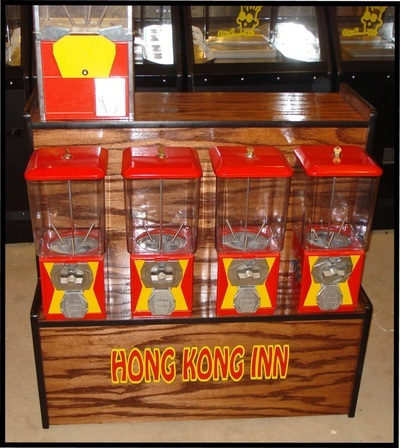 2) All coin mechanism are $1.00 for the most part. They may vary. 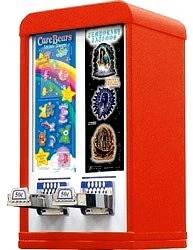 3) Attractive and unique Vending machines. 4) No need to purchase racks for mounting. *** one set of keys, must buy all machines in one lot or have own keys. *** Photo above is from previous machine lot, actual photo to upload soon. All have a new coat of industrial enamel paint. Come with 1 key each. Call for current inventory / inventory may change at any time. Some stands may be available. Contact us for availability. 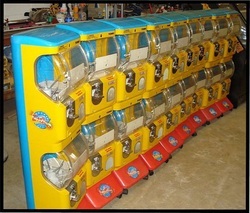 Some 2 column machines available @ $99.00 each. 25 cent coin mechanism ( can be changed out to 50 cent mechanism ). Graphics can read "BEER PONG" or other if requested. 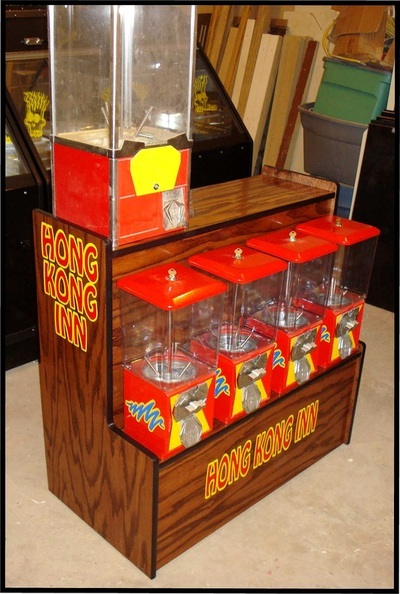 Condition: Refurbished heads adapted with special vend wheels and parts to allow vending of ping pong balls. Bases were custom made from Melamine w/ graphics added. We may consider to produce more of these on a custom order basis. Price: $138.00 Each if picked up locally. Contact us for more details or let us know if you have any questions or special request. Below are example photos of items we have come in from time to time. Contact us about our current inventory. 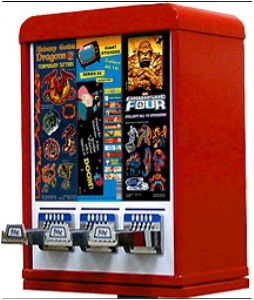 We get in a variety of machines such as Mcgregor coin pushers, skill dragon Quarter Pusher, Silver Falls coin pusher, kinetic gumball vending machines, spiral gumball machine, pull tab machine, cherry master, 8 liner, bulk candy, toy capsule, bouncy ball, sticker vending machine, tattoo vending machine, baseball card vending machine, spiral gumball machine, tomy gacha, playmation bouncy ball, Oscar's wild ride gumball machine, wowie zowie gumball machine, entertainer gumball machine, kinetic kid gumball machines, crane, claw, plush toy machine & many many others. Check 0ur inventory often.